Deluxe 12 inch Dutch Oven Cast Iron Dutch ovens are known for making some of the most delicious meals, from slow roasted meats to your favourite fruit cobbler. When cooking with this deluxe nine and one third quart, 12" Dutch oven your menu will expand because the lid doubles as a full size skillet. Simply turn the lid over to cook eggs, bacon or pancakes, then replace the lid and start cooking your favourite potatoes for the next meal. 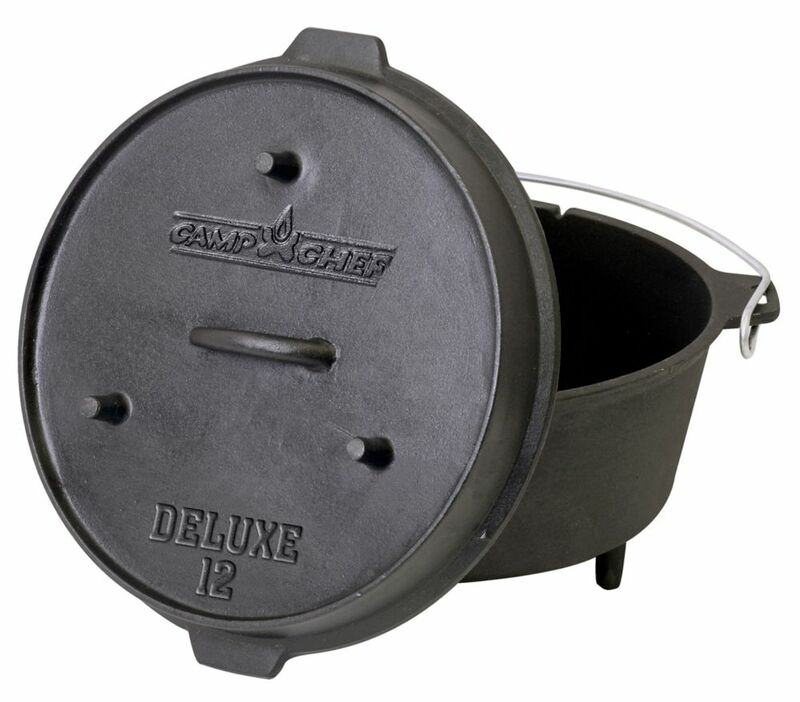 Deluxe 12 inch Dutch Oven is rated 5.0 out of 5 by 4. Rated 5 out of 5 by HomeDepotCustomer from Since I am not going to use the Dutch oven... Since I am not going to use the Dutch oven a lot in the fields, I did removethe handle and eliminated the three feet on the bottom part.All seems to be working as expected and I do like that the stove holds the heatfor a pretty long time after being removed from the stove.Since I am not used to break in the cast iron, I did cause a 'smoky kitchen'and had the smell all over several rooms of the house.After that little mishap all is working find and I do enjoy using the pot. Rated 5 out of 5 by GRMiller from Great cast My son bought me this for Christmas. Though i haven't yet used it I cook almost exclusively with cast iron. This is my first piece from camp chef and it definitely looks to be of high quality. I'll be making a big pot of chili quite soon I'm sure. Rated 5 out of 5 by Anonymous from Cast and factory seasoning are high quality I like this oven a lot. The cast and factory seasoning are high quality, and the design of the lid with its legs, flat inside and high sides make it more functional as a skillet or griddle without affecting its function as a lid. The Lewis and Clark canoe on the lid give it personality and add to the good times this thing was made for. Rated 5 out of 5 by Wendy from This was worth buying! This was the perfect item for my husband as he camps regularly and cooks for large groups of people. This oven is great because of the wide variety of things you can cook with it. The commemerative lid was a nice addition also!